How a highly productive collaboration among a trio of creative Angelenas—and a good dose of Barragán—turned a dark and beleaguered mid-century house into a family home for the ages. A good dose of Barragán—turned a dark and beleaguered mid-century house into a family home for the ages. The paint colors chosen by the residents and architect Linda Taalman are American Cheese 2019-40 and Blushing Bride 2086-50, both by Benjamin Moore. The living room has a Dadone sofa by Antonio Citterio for B&B Italia and a Safari chair by Arne Norell. The master bedroom features a Case Study bed from Modernica. Devis works in the kitchen. 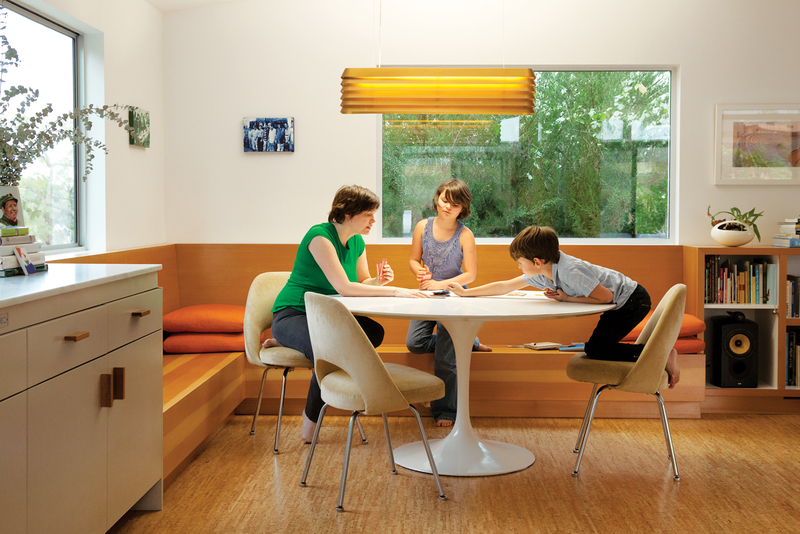 Purdy, Eva Luna, and Simon play cards under a Louvre Light by Established & Sons. The cork stairs with a rope railing lead down to the kids’ level. Simon and Eva Luna play in front of a wall covered in Daks wallpaper from Walnut. 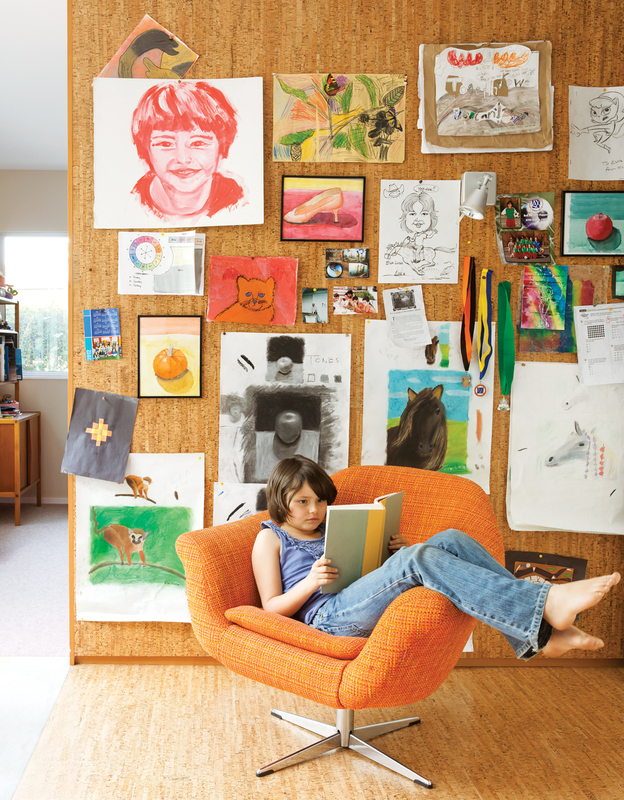 The pair’s art covers a cork wall where Eva Luna reads in a vintage Danish lounge chair. The first thing landscape designer Laura Cooper asked Devis and Purdy was to recall childhood gardens and outdoor play. 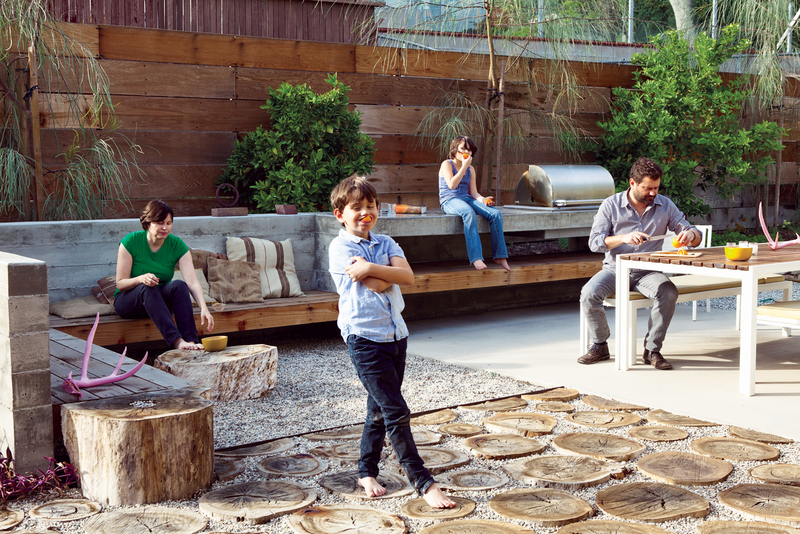 In that spirit, she designed their backyard, integrating the high ground with the low just outside the “kids’ wing.” The resulting series of outdoor rooms on this quarter-acre is full of memory and play. Near the house, Cooper clustered lush, big-leafed plants philodendron, purple heart, and flowering canna. Farther out, vegetable gardens sprout in raised beds, and thyme and mint thrive beneath citrus trees. Native California silver wild rye and matilija poppies bind the slope, bordering the low “snake wall” that winds around the yard, narrowly ducking beneath a big ficus tree with just enough clearance for a sprinting kid. Wide stadium steps connect the garden levels, turning the steep hillside into amphitheater seating. Some 35 percent of the materials from the renovation were resurrected in the yard: Redwood panels became fencing. Blocks cut from original concrete patios form the snake wall. And Purdy plans to crochet colorful cozies over various branches and stumps. When experimental filmmaker Laura Purdy describes the transformation of her house in Los Angeles’s Los Feliz neighborhood, she speaks glowingly of a “perfect storm” among the women who collaborated on the renovation. For about a year, architect Linda Taalman, landscape designer Laura Cooper, and Purdy met for creative sessions, exchanging ideas as they converged on a detail or spatial sequence. “In a field so often dominated by men, it was unusual to find myself in these intensely fruitful all-female meetings,” recalls Taalman. As the women met—getting critical input from Purdy’s husband Juan Devis and Taalman’s husband and former codirector at Taalman Koch Architecture (TKA), Alan Koch—their children often played together in the background. And like those great conversations, the resulting design acquired its own flow, full of colorful narrative, spirited counterpoint, and anecdote. Now, in place of dark, disconnected spaces, outdoor rooms echo luminous indoor ones, and Purdy and her family’s eclectic collections of art and personal artifacts share space with flashes of pattern and interior planes of saffron and pink stucco. Vibrant as that infusion of color appears, the renovation strikes a gentle balance. 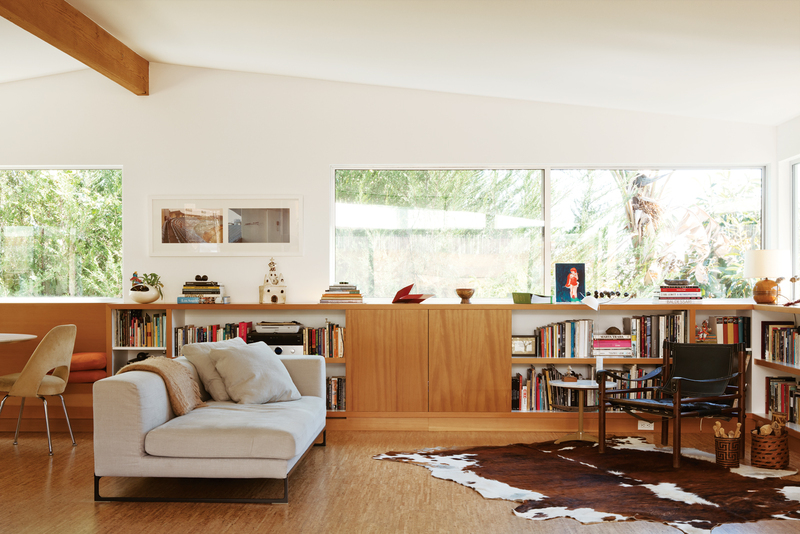 Taalman extracted the latent design intent of this quiet, mid-century-modern house while imbuing it with the warm character and spirited life stories of Purdy, Devis, a Colombian-born filmmaker and public-television producer, and their two young children. Their 2,000-square-foot home was the 1952 work of 23-year-old Les Guthrie (who later developed Redondo Beach’s King Harbor Marina). Tucked behind a carport on a cul-de-sac, the white-stuccoed building steps down a slope, largely hidden from the street. Once in their new home, they made few changes, pulling up carpet to reveal existing parquet floors and sandblasting green paint from interior paneling to expose redwood. The main living level provided three side-by-side bedrooms—fully occupied following Simon’s birth, in 2006—and the lower floor a home office and playroom. But, by 2009, they were outgrowing the arrangement and, much as they loved the place, wearying of its dark interiors. Among the architects approached for remodeling, only TKA proposed adding no additional square footage. “The house had good bones,” Taalman says. “We could solve the shortcomings within the existing envelope by creating a master suite, a grown-up retreat upstairs, and a kids’ zone with bedrooms and a playroom below.” The clients leapt for it. Good as the bones were, Taalman remembers, many rooms and connections seemed spatially “trapped or dead-ended.” A laundry room came between the kitchen and backyard. The lower floor lacked flow to the outdoors. And the yard’s two levels—paved in concrete and separated by a steep slope—barely communicated with each other. TKA soon enlisted Cooper, an unconventional, self-taught landscape designer who trained as an artist and teaches at Art Center College of Design in Pasadena. The process ultimately involved stripping the building to its studs to modify openings and achieve an even finish. Now, from the street, the house appears virtually unchanged—but just over the threshold, an animated dialogue begins. A new floor-to-ceiling window, facing an existing one, transforms the entry hall into a luminous, glass-walled connector, introducing glimpses of color and a visual link between indoor and outdoor spaces. Cork—replacing an eye-stalling patchwork of parquet—gives the entire floor continuity and a soft bounce underfoot, and even runs down steps and up some of the kids’ walls, morphing into a pinboard. Its flecked rhythm echoes the back patio’s round eucalyptus “pavers,” salvaged from a moribund tree. “For every indoor space, I wanted to create an outdoor counterpart,” says Cooper. Through big living-area windows, a black-and-cream-tiled wading pool appears, reading almost like a patterned rug just outside the glass. 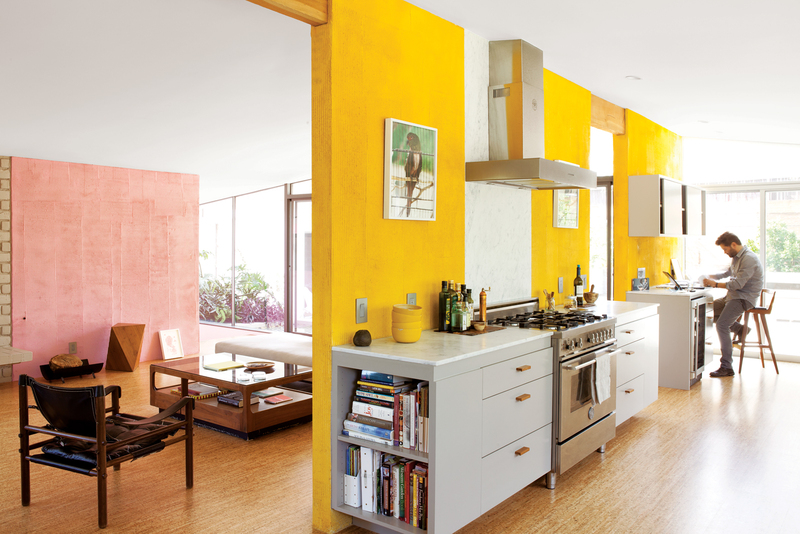 Nearby, jungly plantings evoke the tropical warmth of Devis’s native Latin America and the era in which the house was built— as do the living room’s raked-stucco walls in pink and yellow, inspired by architect Luis Barragán’s Mexican modernism. These vivid, rustic planes—some extending from inside to out—contribute to the living area’s newfound architectural clarity (inherent but partially trapped in Guthrie’s design). Freed from compartmentalizing partitions, a fluid living-dining-kitchen area now rises to the existing pitched ceiling. Taalman created a glass doorway between the kitchen and patio that seems as if it’s always been there. Downstairs, a big glass panel, hung from a barn-door track, opens the playroom to the outdoors. Here, as in the master bedroom, a single wall of artfully patterned wallpaper animates the space—lightly echoing the living room’s energizing stucco. And a bit of improvisation during construction yielded such playful touches as a large porthole between the kids’ zone and a stairway with a rope handrail. Though Taalman and Purdy ardently sought out just the right materials and finishes, the results are remarkably laid-back, with children scampering about and artwork, ranging from playful to provocative, displayed in thoughtful yet unfussy ways. 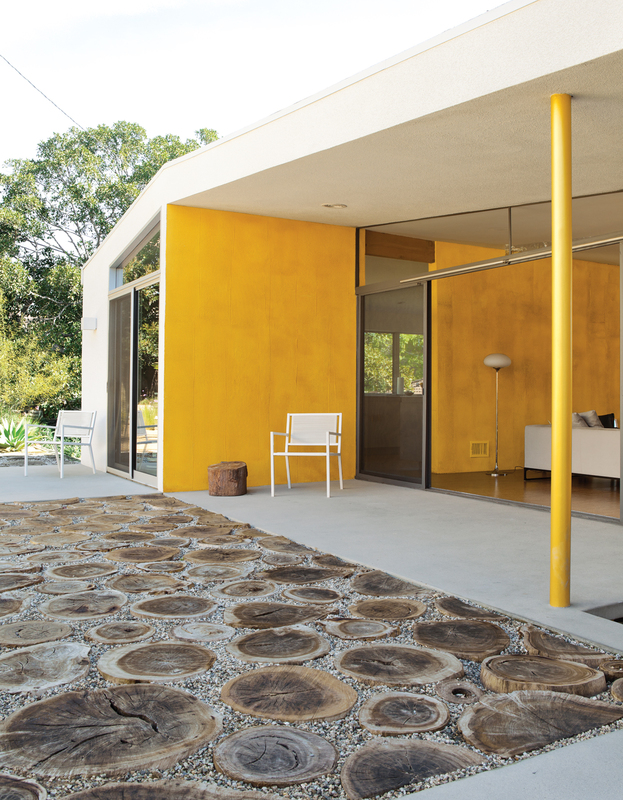 Just as the stucco reveals the raked process of its creation, the Devis-Purdy House and landscape conveys, most of all, the quality of collaboration that went into their making—and, in the end, the family that brings it all to life.